Now, You can make your own paper CD/DVD cases especially designed for the comics CDs (Bozo, Casper, Baby Huey, etc.) you purchased from Mark's Harvey Comics & Cartoons--FREE! You thought origami was only for making paper swans and other cute but useless stuff. Not any more! Download and print the free Microsoft Word files on standard letter size (8.5" x 11") paper and fold into a CD case. The case has a pocket that holds the CD securely, it opens and closes easily and it's cheap! You can use the same design for your other CDs as well. This convenient and useful CD case was created by Thomas Hull. You can download his folding instructions in an Adobe Acrobat (.pdf) file as well. Download Baby Huey No. 1, Bozo, Casper No. 1, Harvey Hits No. 3, Harvey Hits No. 9, Hot Stuff No. 1, Little Dot No. 1, Richie Rich No. 1 CD cases in Microsoft Word format; open each file in Microsoft Word to print CD cases. 1. Fold the left and right sides on the vertical outside fold lines as shown in step 1. 2. 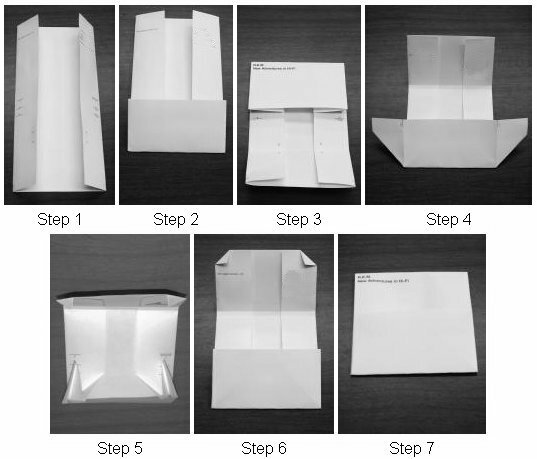 Fold the bottom edge up to the middle of the paper on the horizontal inside fold lines at the bottom fourth of the page as shown in step 2. Then fold it back. This part will be the pocket. 3. Fold the top edge down on each of the two horizontal parallel inside fold lines. These two folds form a spine with the title printed on it. Fold back. This will make the spine and top flap. 4. Spread the sides of the pocket to the sides to create "wings". Fold inward on the upper diagonal inside fold lines and outward on the lower diagonal outside fold lines on each edge of the folded paper. 5. Tuck the wings behind the front part of the pocket s shown in step 5. Flatten the pocket. Your CD will go in the pocket. 6. Fold over the corners on the top flap. 7. Insert your CD and tuck the top flap into the pocket. That's it!